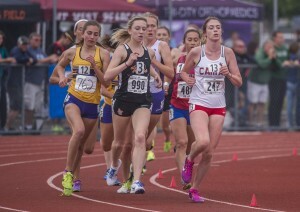 Emma Jenkins of Camas lead the pack for several laps of the 4A girls 3200 meter run at the state 2A, 3A, 4A Track & Field Championships held at Mt. Tahoma High School in Tacoma, May 26, 2018. Then she fell to fourth place in the last laps. Brinley Jackson, 100-200, Union; Ellie Postma, 400, Camas; Presley Timmons, 800, Skyview; Krystal Kaufman, 1600, Skyview; Madison Child, 3200, Camas; Olivia Green, 100H, Skyview; Annaliese Ward, 300H, Union; Rebecca Knight, HJ, Camas; Madi Schalk, HJ, Union; Andy Scalberg, PV, Union; Lucy George, LJ, Camas; Emily Mattsen, TJ, Heritage; Genina Carey, SP, Union; Lexi Raymore, DIS, Union; Katie Penueta, JAV, Heritage.